A couple posts (months) ago, I posted some data that indicate that when a mouse sniffs, the odor code evolves over repeated sniffs. While inspecting that data I also observed that some cells seemed to respond AFTER the odor stopped, which I call a post-odor response. Today I am going to show examples of cells that have post-odor responses, and that the population contains enough information to identify odors. First, I will show how a few cells that continue to respond after the odor has stopped. Individual cell-odor pairs can respond during the post-odor phase in a variety of ways. Some cells that fire phasically during the odor maintain that firing during post-odor breaths (below, top), while other cells change the phase of their firing (below, bottom). In general, it seems that following the odor, cells shift the phase of their firing to earlier in the breathing cycle (figure not shown). This cell had a phasic response during the post-odor period, but had a markedly different phase. 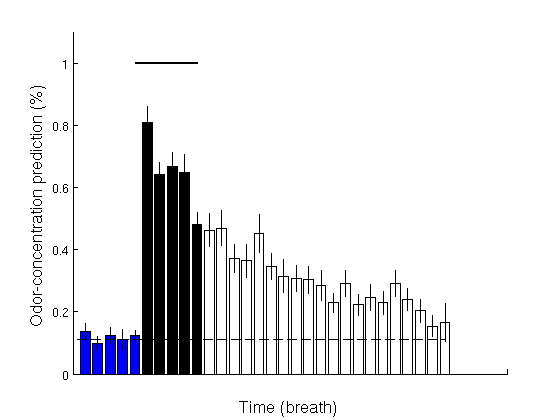 During the odor, the cell was phasically inhibited between 150-250ms; during the post-odor, the inhibition (and excitation) shifted to earlier in the breathing cycle. In addition to cells that had phasic firing during the post-odor period, many cells had clear, prolonged excitations and inhibitions (see below). 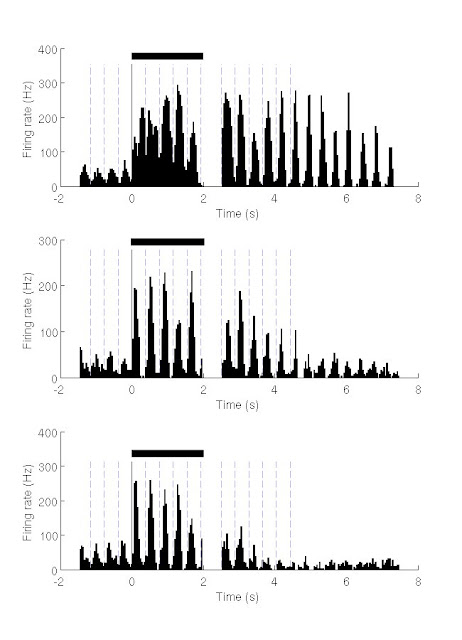 Of >300 cell-odor pairs recorded, ~20% had a phasic response during the post-odor period, 10% had a tonic response (excitation or inhibition), and 5% had both a tonic and phase response. Approximately 10% of cell-odor pairs had a post-odor response without having an odor response. The above responses were all performed at a single, high concentration (5% dilution of pure odorant). This led me to worry that these post-odor responses were artifacts of the high concentration used, perhaps due to lingering odorant in the olfactory epithelium. To test this idea, I repeated the experiment using lower concentrations of odor (2%, 0.4%, and 0.1%). When I did so, I found that individual cells continued to have information at the lowest concentration, and that the post-odor responses contain concentration-specific information as well. This cell's post-odor response is different for three concentrations. From top to bottom, concentrations are 2%, 0.4%, and 0.1%. To verify that the above responses contain odor- and concentration specific information, I built a population vector, and used a prediction algorithm to see whether the vector can predict the odor and concentration in single trials. The predictor was quite good during the odor, predicting both odor and concentration at >60% (figure below). During the post-odor breaths, it continued to predict above chance for ~15 post-odor breaths, showing that the information is long-lasting. To see whether the predictor's post-odor success is due to odor- rather than concentration discrimination, I also looked at the predictor's ability to choose an odor within each concentration, or to choose the concentration within each odor. In all cases, the results were similar. The post-odor response contains odor- and concentration-specific information. Prediction algorithm was built as described previously, and forced to identify both the odor and concentration. Pre-odor breaths (blue bars) are at chance. During the odor (black), the predictor is quite accurate given the difficult task. During the post-odor, the predictor continues to be above chance (white bars) Chance level is 1-in-9 (3 odors at 3 concentrations). Odors are Amyl acetate, 3-hexanone, and butanal at concentrations of 2%, 0.4%, and 0.1%. N = 110 cells from 2 mice. The above figures show that individual cells can continue responding in the absence of odor, and that these responses are odor- and concentration specific. The Laurent lab have reported similar findings in insects, although they did not focus on the post-odor responses (Stopfer et al, 2003, Mazor and Laurent, 2005). It should be noted that the sampling dynamics are quite different between insects and mammals. I am also reticent to draw parallels with vision's OFF responses given the different timescales. In thinking about these post-odor responses, I think the two key questions are how and why? Regarding the how (mechanism), I can think of a few sources. First, there could be a lingering odor presence, but I think this is unlikely. Physically, odors diffuse quickly in air, and our experimental setup includes aspiration, which should make the lifetime of the odorant short. In contrast, the cells and the population contain information for >3 seconds. The next source could be persistent input from ORNs. Some ORNs in flies have “super-sustained," "ultra-prolonged" responses, and continue firing after the odor is gone (Montague et al., 2011; Turner et al., 2011). 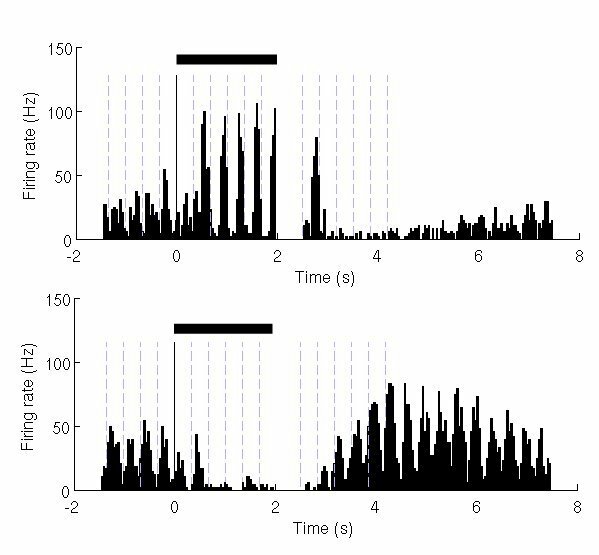 Calcium imaging in dendritic tufts show that the calcium activity continues at a low level after the odor presentation has finished (Charpak et al., 2001). However, this persistent ORN input would have to be at a lower magnitude, given that calcium imaging does not show whole-glomerulus activity. This lower activity would be in stark contrast to the strong responses during the post-odor. The final possibility is that recurrent connections in the olfactory bulb, or higher areas, maintains a dynamic representation of the previous odor. 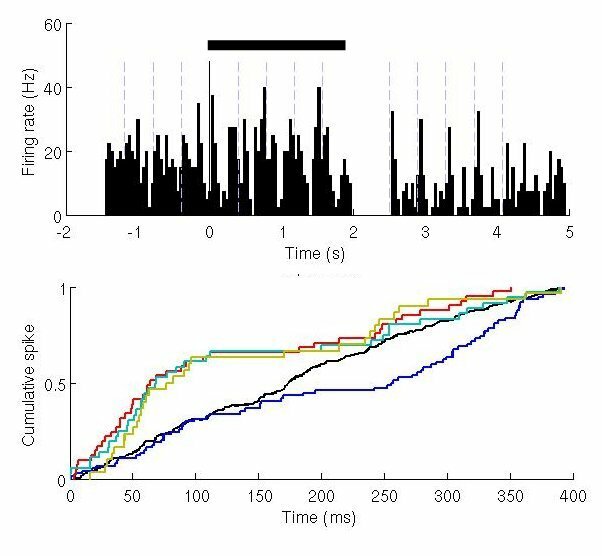 Recordings from mitral cells in slices have shown that olfactory nerve stimulation can cause sustained activity for seconds (Chen and Shepherd, 1997; Aroniadou-Anderjaska and Ennis, 1999; Carlson et al., 2000; Lagier et al., 2004), due to dendrodendritic interactions between mitral cells (I think). While olfactory nerve shock in slices is a simpler stimulation than odors presented in vivo, similar mechanisms could result in continued activity in mitral cells absent odor. Regarding the why (purpose), the long duration, and odor specificity of the post-odor responses make me think that the post-odor responses are a form of short-term or working memory. What is intriguing about this sensory memory is that there has been no report of a perceptual analog: that is, odor perception in the absence of odor. 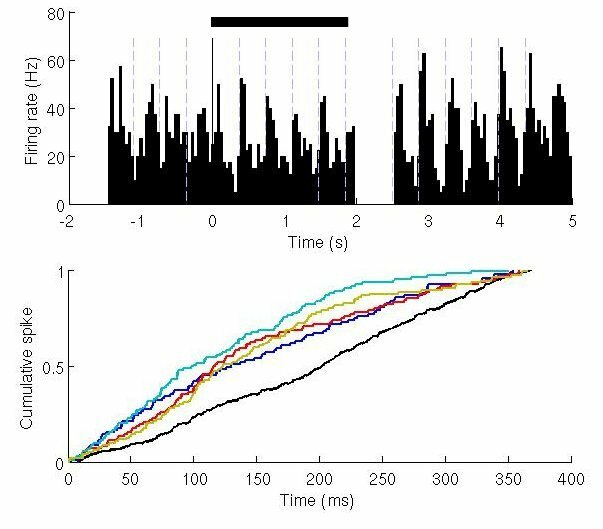 In contrast, stimulus aftereffects in vision and audition are typically associated with perceptual analogs. This olfactory memory could be useful in complex contexts where animals encounter multiple odorants in a time-varying fashion. Being able to store information about previously encountered odors could make it easier to identify new odors.